21 Ways Gout Can Kill You is my review of fatalities from excess uric acid. Also what you can do to prevent gout from killing you. You suspect you have gout but do not have that confirmed as a medical diagnosis. You have been diagnosed with gout but your uric acid is not being treated to get it below 5 mg/dL. Note some gout patients cannot achieve 5 mg/dL. So you might have to settle for 6 mg/dL, as advised by your doctor. Can you really die from gout? Gout sufferers often complain “gout pain is killing me”. By which they mean the intense pain from gout flares makes you feel like dying. But however bad gout pain gets, that pain will not kill you. So if you only need to stop the pain, you should leave now to read How do I stop Gout Pain?. Because this article is about fatal effects of untreated excess uric acid. People typically ask “Can you really die from gout” if they are looking for an excuse not to treat uric acid. So I call people who refuse to get their uric acid safe Gout Victims. Because I hope to persuade gout victims to choose a plan to recover from gout permanently. You can see these other plans at Questions for Gout Sufferers. But for now, let me explain how gout can kill you from excess uric acid. Many people claim that gout is not a deadly disease. But that is because gout actually refers to the pain and swelling you experience. So doctors call that gouty arthritis caused by high uric acid (hyperuricemia). That means, medically, it is hyperuricemia that kills you not gout. But that semantic argument just clouds the issue. Therefore the answer to “Can you really die from gout?” is definitely “Yes!” So, I’m going to summarize a new report that explains 21 ways that gout leads to death. Then, after my review, you can see how to stop gout killing you. A new report explains several ways that gout can kill you. The report explains many aspects of gout, including why and how gout sufferers should control uric acid. But I’m going to focus on the “associated comorbidities” section. That is diseases that are linked to gout. Overall, some evidence collected in experimental and epidemiological studies supports the association between increased sUA and gout with the development of cardiovascular (CV), renal and metabolic disease. So we see a general link to heart disease and kidney disease. Together with the more general metabolic syndrome. However, the report does not include specific fatality rates associated with these diseases. Yet we can immediately see that gout is associated with higher risk of death. increased Uric Acid can induce vascular and tissue damage through multiple pathophysiologic mechanisms, such as endothelial dysfunction and oxidative stress, vasoconstriction, and stimulation of renin-angiotensin system. These processes act at the kidney level, within arterioles and tubular cells, as well as at the systemic vasculature and tissue level causing hypertension, atherosclerosis, and myocardial dysfunction. Now we see how uric acid attacks multiple parts of vital organs. 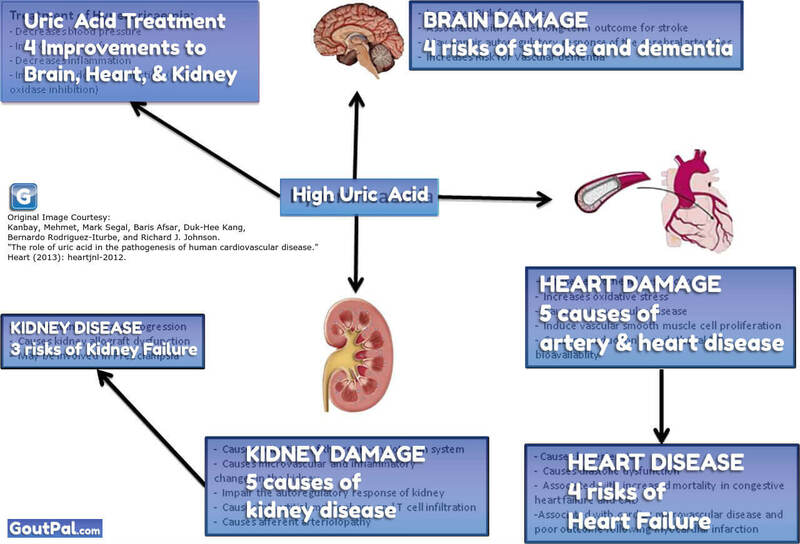 So kidney damage from gout affects our heart and arteries leading to heart failure. Click the image for the full list of 21 Ways Gout Can Kill You. Also, click it to see 4 ways that uric acid treatment can improve brain, heart, and kidney health. Fortunately, uric acid is easy to control. So first you must discuss different treatment options with your doctor. Then follow the appropriate plan for gout recovery. In the meantime, you can discuss how to stop gout killing you. Also, I explain examples of deadly gout at Is Fatal Gout Killing You? Scirè, Carlo Alberto, Cristina Rossi, Leonardo Punzi, Augusto Genderini, Claudio Borghi, and Walter Grassi. “Change gout: how to deal with this ‘silently-developing killer’in everyday clinical practice.” Current medical research and opinion just-accepted (2018): 1-12.